Hi everyone. For a short while we have a little internet (very little as it turns out, so maybe no pictures just yet) and so wanted to say hi. We are in Warderick Wells, which is the headquarters for the Exumas Land and Sea Park. The anchorage is a very distinct channel between otherwise very shallow water, so the colors are really stunning. We'll post pictures as soon as we get more bandwidth. We are once again among other people, but there are still no services just yet. We're getting down to the last of our fresh food - a few carrots, cabbage, cheese, butter, 3 tomatoes, potatoes and garlic - so we have broken out the canned food finally. The kids have decided that they LOVE canned fruit. :) Canned asparagus, not so much. Personally, I've started to day dream about restaurants in Seattle. Yesterday, it was the new(ish) french restaurant on lower Queen Anne -- beignets and french coffee, yum! The wind is forecast to blow hard over the next few days - 20 knots or so - so we are probably going to stay here until it dies down. We are then headed to Farmers Cay for the 5 F's festival (First Friday in February Festival at Farmers). We will then start watching the weather to head north. We were here in Warderick Wells and at the 5 F's Festival 9 years ago for our honeymoon. I know it shouldn't be surprising, but things have changed here at Warderick Wells and, strangely, it makes me a bit sad. As one example, last time, you could do volunteer work at the park to offset the cost of the mooring ball. Back then (with our smaller boat), the ball was $15, and I think we put in 4 hours each of hard labor to offset that fee, including hauling and making concrete by wheelbarrow/hand. It was really hard work, but it was also fun and we got to meet many of the other cruisers. This morning, we asked whether we could volunteer this time - our mooring fee is up to $20 (egad!) - but they don't really have the volunteer program in place. And there's are now t-shirts and souveniers to buy at the park office. Which makes it all feel a bit more formal and impersonal. But it's still stunningly beautiful. We'll take lots of pics and post them down the road somewhere. below working to set up a wind generator that we bought in Ft.
the reverse osmosis water maker working, make our own water. generator), but none of the projects are super urgent. each day so we are better able to anticipate the context. jump on the web every 5 minutes to look something up. basically no soil to support crops. 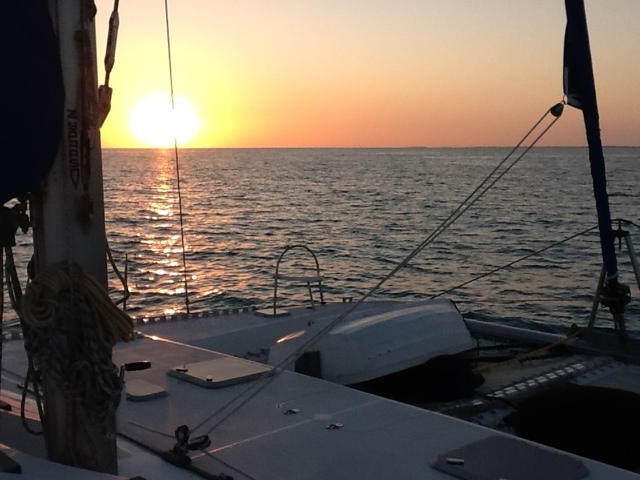 We are on a mooring ball at Alligator Reef Lighthouse in the Florida Keys, positioned to cross the Gulf Stream tonight. The sun is setting and I'm about to make pasta for dinner. We plan to leave around 10 p.m., with Danny and I trading watches while the kids sleep. We should reach the west edge of the Bahamas in about 10 hours. We'll post from the Bahamas when we can. Happy snow day to all our friends in Seattle. We left Marathon, FL this morning and poked our heads out into the Gulf Stream toward the Bahamas. The seas are small but really lumpy so it was a pretty uncomfortable ride. 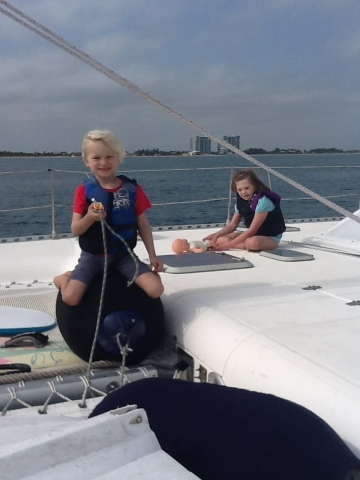 Next thing we knew the kids were whining and laying down because they were "tired" (translation: getting seasick). We hadn't considered seasickness meds for them this morning since the seas were so small, but in retrospect that would have been a good idea. (The good, prescription seasickness meds take a few hours to kick in.) So we are right now headed back to the Florida coast. The window to cross to the Bahamas extends through tonight, so the plan is to stop soon, rest, and then cross tonight. Meanwhile the kids are resting. No comment on what happened to the blueberries Hannah had for breakfast. 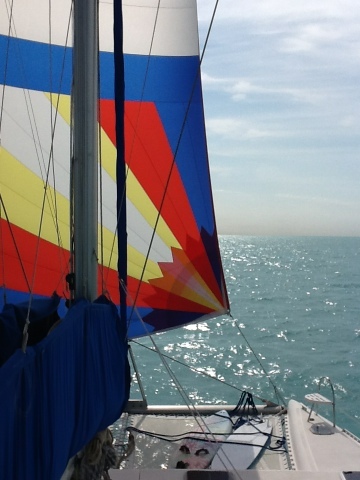 ... with just the spinnaker flying in the Florida Keys. Oh yeah. That's the sound of us changing plans at 4:30 in the morning. We have a good crossing window, but we don't feel ready to take it since we just got out of the yard/marina yesterday. We haven't been traveling on the boat for nearly 2 weeks, and the boat is so new to us, we want to run it (and the systems) for at least a few days before we undertake this crossing. The delay will also give us a chance to install a new wind generator we bought in Lauderdale. We're going to head south to the Keys and then probably cross at the next window. We think, however, that all is not lost, as it is apparently it's lobster season in the Keys. So we probably won't be miserable there. Our passage to Miami today was wonderfully uneventful. And as a fitting farewell to Fort Lauderdale today, we saw Steven Spielberg's yacht Seven Seas. Oh my, Google THAT if you want to see something about the lives of the rich and famous. The weather looks favorable to cross the Gulf Stream tomorrow, so after a dinner of left-over spaghetti, we're prepping the boat to cross to Bimini in the Bahamas early tomorrow morning. We will probably leave around 4 a.m. Danny installed the jack lines and secured the dinghy to the davit/arch; we checked tides and will shortly be suspending our cell phones indefinitely (which feels strange indeed! ); we're also stowing random stuff, checking fluid levels in the engines, and calling relatives. So if all goes well, we won't post for a bit, since we don't expect to have reliable Internet in the Bahamas. But we'll post when we can. We had a couple more delays at Lauderdale Marine Center, but we are offshore again heading south to Miami. There is a weather window to the Bahamas today and tonight so we are considering dropping the hook in Miami this afternoon and making the crossing tonight. We will post as we leave Miami if we do that. It has been really disruptive psychologically to be at a marina for nearly 2 weeks with nearly all the conveniences of home (laundry, unlimited shore power, a rental car, etc.). And now it is feeling very strange to be moving. We look forward to being back in cruising mode. Our stay at the Lauderdale Marine Center, captured in pictures. There we are, sandwiched between a 60' carbon fiber Gun Boat named "Elvis" and Johnny Depp's boat (appropriately incognito - not really, it's covered because it's being painted). Uh, which one of these does not belong here?!? Elvis going back in the water. Note the size of the lift operator to the lift, which has a 300 ton capacity. The mechanical update is that the props are adjusted well and everything else seems to be working well, so we're probably going to Miami tomorrow. We've been out for so long it feels strange! Sorry for all the text and no pictures (I've yet to sit down to download pics from the camera). We got the new sail drive on January 5th, which was Rye's 4th birthday. We got it installed that day but then learned that the Travelift was booked all day Friday, so the earliest we could drop back in the water was Monday at 3. So we ran a bunch of errands and tried to get stuff done over the weekend in preparation for dropping in today. The kids had an amazing time riding scooters around this GIANT, empty yard on the weekend. We splashed today at around 3, but while we were in the water (but still in the slings), we discovered there was an adjustment that needed to be made to the propellers. So we got pulled BACK OUT and are spending the night "in the slings," as they say. The props have now been re-adjusted and so we expect everything to go well tomorrow. I will say that it's super comforting to be here at Lauderdale Marine Center and working with Just Catamarans on this stuff, because everyone REALLY knows what they're doing. If we do leave Lauderdale Marine Center tomorrow, we might try to make it to Miami tomorrow (which is really just down the road). And there might be a weather window Wednesday for the Bahamas. We'll see. Pics coming soon, I swear. We originally hoped to leave West Palm Beach last Wednesday, but when we went out to pull the anchor, Danny decided that one piece on the windlass (the equipment that pulls up the anchor) needed to be fixed. No big deal, just a one day delay in a long weather window to cross to the Bahamas. The fix took until about noon, so we decided to spend one more day in Palm Beach and run one last errand that afternoon. So we set off to run that one-last-errand (can you hear the ominous, foreshadowing music yet? ), and to knock it off our list more quickly Danny decided to use one of the kid's scooters. In the (literally) last 5 feet of his ride, he hit a hole in the sidewalk and pitched over. Lots of road rash, but that seemed to be the worst of it (no head injury, thank god). Until the next morning, that is, when Danny woke and was so dizzy he was unable to sit up or even walk to the bathroom without the room spinning and feeling like he would vomit. We decided to head to a marina ASAP both because we needed water (we hadn't turned on the water maker yet because we were in the intercoastal) and so that we could get to a hospital, if needed. Danny took some seasickness meds and by noon he was able to walk up to the cockpit and sit down (which is all that's needed to run the engines as long as Susan's doing all the rest). So we headed south to the Riviera Beach Marina (right at the Lake Worth inlet). Danny was feeling a lot better by that afternoon when we got to the marina, although he did end up vomiting. We spent a reasonably pleasant night at the marina (Susan made Coq au Vin in the pressure cooker) and the next morning Danny felt MUCH better. So we decided to head out off shore (see previous post). We headed out the cut and were having a great morning. Conditions were dreamy. Then suddenly all noise from the starboard engine dropped. Uh, that is not a good sign. We shut the engine down and speculated that we blew the sail drive seal, which we knew was leaking but could have held for a long time. 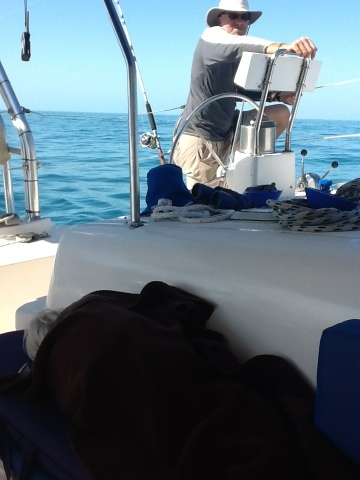 So we continued under sail and with the port engine running and called our beyond wonderful broker, Phil Berman of the Multihull Company, who referred us to Just Catamarans at Lauderdale Marine Center. We scheduled an appointment first thing Monday with Johan at Just Catamarans and were hoping to pull the boat (yes, out of the water) then. We spent New Years weekend at the Las Olas Marina, a block from the beach, which was fun. The first opening to pull the boat was today at 11 a.m. Although we were hoping for a quick fix, as soon as the boat was out of the water we were stunned to see that the sail drive was cracked - which is a MUCH bigger deal than replacing a seal. It looks like maybe a gear broke loose on the inside of the drive and caused additional damage, so we think we have to replace the entire drive (not just the lower unit). So we are up on the hard at Lauderdale Marine Center waiting to see how quickly we can get a replacement sail drive. 1. A killer cold front came through yesterday and the low tonight is expected to be 39. 2. Lauderdale Marine Center is lovely (it's the largest marine center in the US), but not exactly kid friendly. 3. We are bleeding money. 4. The kids can't leave the inside of the boat now because the deck, instead of being just 6' off the water, is now about 15' off the cement. 1. 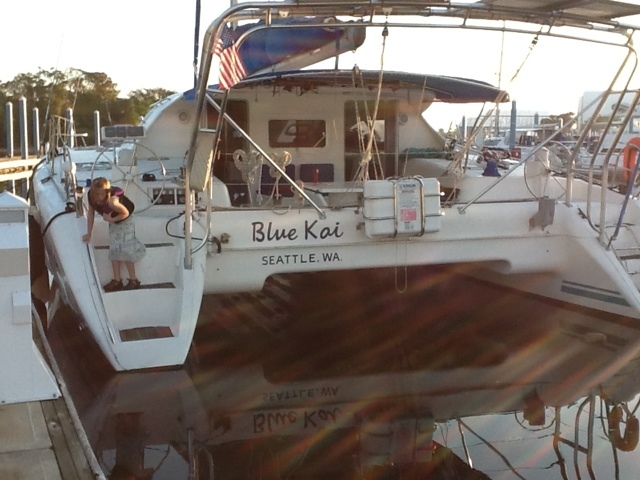 There are few marinas with Travelifts big enough for our beam (26'). So we're lucky we were headed this way when the sail drive broke. 2. In the yard, we are sandwiched between Johnny Depp's boat and a 60' Gun Boat catamaran named Elvis (this is ultimate Danny's dream boat - I think even the toilet paper is made of carbon fiber). But unfortunately, the lift operator told us that Johnny doesn't usually come visit his boat while it's in the yard, but I'm keeping a sharp eye out just in case. 3. There are showers, wifi and laundry here. In fact, the kids and I are currently sitting in the "Captain's Lounge." 4. We will have a new starboard sail drive. And that will help us sell the boat after our trip. 5. We're healthy and have a great boat that's well stocked and ready to head to the islands (well, just as soon as that sail drive is replaced). Depending on how long it will take to get the new drive, we may rent a car tomorrow and head to the keys. But we don't expect to go anywhere for a few days. There is a window to cross to the Bahamas at the end of the week, so maybe we'll catch that. If we're lucky. I took some great shots of the boat on the list which I'll post as soon as I download the pics from the camera.